Cueva Llueva (El Biggo) is the eastern entrance into the Four Valleys System (line survey). A route through exists into the Matienzo depression - via Cueva de Carcavuezo (081), and to the Riaño valley - via Cueva Hoyuca (107) or Cueva de Riaño (105), although no through-trip has been attempted. The walk to the entrance is almost impenetrable jungle at times (1993, 1994) and a couple of attempts have had to be abandoned. At Whit 1995 the cave was entered after abseiling into the entrance depression from the meadow 30m above. In 1995, the entrance was re-located after a 3 hour jungle bash. In 1996, less time was needed. In 2000, the entrance was approached from the meadow around the back. In 2007-2008, the route off the road had been cleared and access was straightforward. In May 2012, the route was clear. The depression, however, has been used as a dump, probably by the construction team improving the road. Limestone dust coats the surfaces of the protruding beds in the cliff face and there are a number of tyres on the southern slope and at the base. A layer of mud also covers the lowest point of the depression. (Photos). - On ladders: Three are required, although the vertical element of the drop is only 10m. - In 2007 the pitch was rigged for SRT, requiring a 40m? rope. - At Easter 2014 a traverse line was rigged to the left, "through a passage" where "a ladder was removed and replaced with a rope". The landing is on a sloping boulder pile. A climb upwards leads to an ascending and very greasy calcite ramp which closes down after 40m. 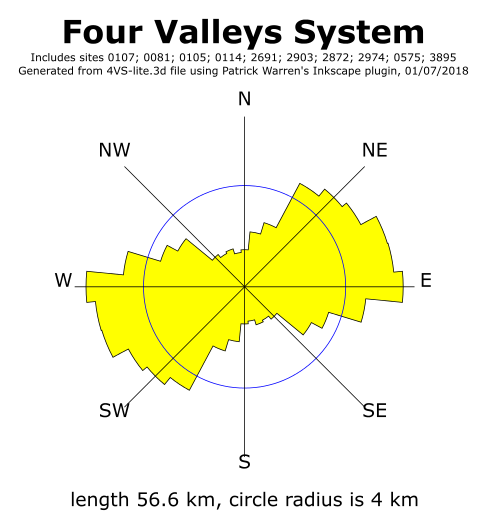 This was surveyed at Easter 2007 and may be associated with holes in the wall to the south of the entrance. A hole opposite the entrance passage pitch has a short length of passage which needs pushing (see 2/8/82), although this couldn't be found in 2007. (In 1995, an "obvious open passage" is mentioned "in the wall behind you as you go up the slope into the sloping mud / calcite chamber above the bottom of the ladder". It may need a 6m scale or bolt. The passage seems about 3 x 2m. This may be the passage entered by traversing left at the head of the first pitch - see above). A steep climb down boulders leads to the river which is presumably the combined waters from Matienzo and Riaño. After sustained heavy rain, when the fields next to the river in Matienzo are about to flood, the river at the base of the pitch can be a torrent with the route up the boulder slope into the main tunnel cut off. With this in mind, and because of the very wet conditions during Easter 2008, a traverse line has been rigged at high level to allow access in and out in all weathers. Downstream, the water enters a high phreatic maze which requires swimming or a inner tube to pass. The length of this section is 100m and half way along it, on the left hand side, a similar phreatic passage leads back to the free flowing river just upstream of the boulder pile at the pitch. The downstream phreas stops at a boulder choke where a climb up to the right and through the boulders leads to a "pop out" in a large passage. The river is then rejoined by walking down a boulder slope. After 200m of pleasant strolling in a 10m high passage a boulder pile is met, on the other side of which is the downstream sump. This has been dived to a depth of 22m, the way on still possibly being open. Another dive in 1995 also came to no definite conclusions, the visibility being only 0.5m. The breakthrough came in August 2012, when Chris Jewell followed the left hand wall in poor visibility until he met a passage. He laid 120m of line down to -15m in a north easterly direction. The left hand wall was followed. The "roof was visible occasionally but the right hand wall was never seen and the floor glimpsed only at the end of the dive." The water is next seen in Los Boyones (site 117) about 1.2km away. There may be a higher level route at the far side of the sump pool to investigate. On the opposite wall to the "pop out" is a low dig which may yield? A short length of passage on the right before the sump intersects a choked, bouldery rift. Climbs into the roof before the sump have been investigated. Following the water upstream from the base of the pitch leads to 100m of swimming which halts at a boulder where it is possible to clamber up to the high level passage. Entry to this is normally gained by ascending a rock pile to the left immediately after first meeting the water. At the top of the slope a superb tunnel rises and falls over boulders for some 300m until the final descent into the lake. A swim across to the right of the lake leads to an ascending boulder pile (RH Fault Passage) beyond which is a sandy crawl which closes down after 60m. On the left of this crawl is a climb up between boulders for 35m where a solid roof is met and no further progress is possible. Fine 4m high columns can be found in this area. At Easter 2009, a 50m climb was possibly made in this area although no survey was carried out. 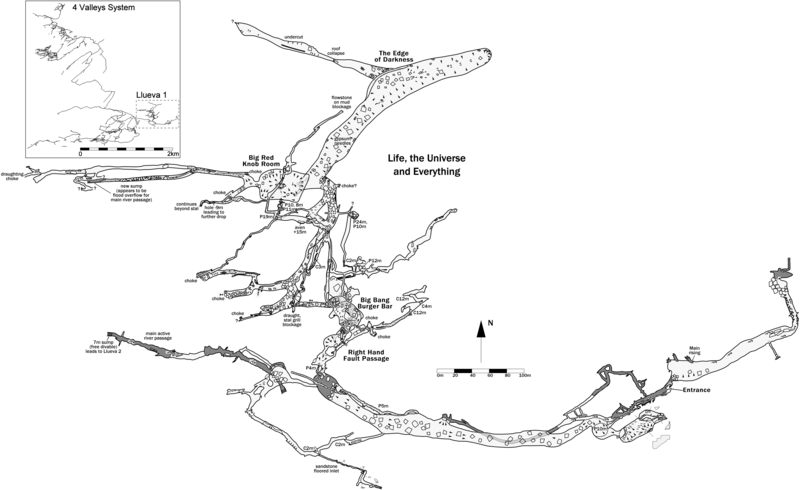 On the north side of the ascending boulder slope in the RH Fault Passage is an aven which was the starting point for the 2007 extensions, called Life, The Universe and Everything. The 3.8km of passages ended underneath the boulders and it is likely that the latter route will be the preferred way in the future. The following paragraphs form a temporary description. The aven was originally scaled and spent carbide found at the top of the climb. A card index / log book search found that the aven had been free-climbed in 1979 to a boulder choke. In 2007, boulders were removed from the choke allowing entry, some 80m above the original climb, to a large sloping chamber (Big Red Knob Chamber)with plan dimensions of 20 x 30m and two passages leading off. Subsequent explorations dropped back down to river level finding an extensive set of tunnels including a parallel, wet weather overflow passage with a sump. 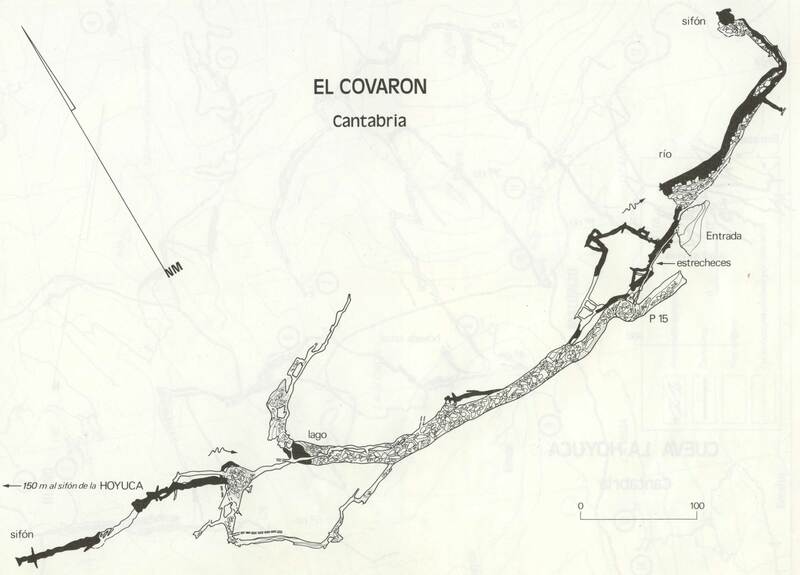 High level passages entered are at the same level as the Trident Series in Cueva Hoyuca and the 50m wide passage at the bottom of Torca de Cillarón. In a middle level, a large, flat-roofed passage (up to 40m wide) heads east-west at an altitude 40m below the lowest point in Cillarón. On a pushing trip in the lower level passages, near the end of a traverse, a flash bulb was found just opposite where a small passage entered. This point was subsequently found by burrowing down through boulders near the columns in the Right Hand Fault Passage about 25m away from where the pole had been used two weeks before! (A grey scale survey of the old cave and new extensions can be found here and a draft colour version here). At Easter 2008, the western side of the high level passage over the Big Red Knob Room was one focus. The end was pushed beyond the stal grille in a similar style with a trench in the floor until it divided. The 9m climb was also pushed down a 7m pitch into a new chamber series that is to be described. Another focus was looking at the boulder chokes: the northern choke has a definite draught. In very wet weather, the climbs up through the boulders to enter the extensions may be impossible because of water cascading down. This appears to be a local feature which responds quickly to rainfall, unlike the main river which takes much longer to respond. At Easter 2014, passage high up in the Big Bang Burger Bar was bolted into (11 bolts; a 20m climb) and an extensive set of passages entered (576m surveyed). This is shown as batches 0114-14-01 and 0014-14-2 in the centre line survey. The passages head over the original Lake and appear to be at the same level as the Trident Passages in Hoyuca. Full description to come from Chris Hibberts. This series was checked out in November 2015 when the team "had a good look in NE boulder choke and unable to find anyway on". Eighty metres back from the lake, a hole 5m up on the right hand wall can be reached by lassoeing a boulder. A smallish, sandy passage branches after 80m, the right hand branch leading to a 5m pitch onto the boulders in the RH Fault Passage, the left hand branch leading to a 30m (undescended) pitch into a large, fault chamber. (In 1995, a dig has the sound of a stream through a narrow crack and there is another draughting dig which needs some work). The easiest way to reach this chamber is to follow the Left Hand Bypass. This starts as a slot down by the wall of the main passage, opposite the right hand wall hole. A mixed 200m of stooping, walking and climbing leads to a couple of inlets which cross the passage. By keeping to the left hand side and crawling under the wall a high, boulder-filled section on the fault can be entered. By missing the crawl a narrow veranda is reached with a view out into the main fault chamber. The left hand wall at this point has been climbed for about 50m but no obvious way on at the top exists. The climb was repeated in 2016 with the same result - and footprints were seen, probably from 35 years ago. Other extensions in and around the LH Bypass? Some during 1995? At Easter 2007, an inlet (on the left after some 70m) was surveyed 92m to a sump. In 2016, the 2016 Extensions were surveyed as batch 0114-16-01, providing 87m of new passage. There is a full description of this in the logbook (26/3/16) which needs tying in with the survey when drawn up. Has the "250m long flat out crawl" been surveyed? The main fault chamber is reached by climbing down over boulders to the right of the veranda. A large phreatic tube to the right of the chamber pops out 10m above the lake. The way to the river is down between the boulders in the chamber. The 200m of upstream passage is swimming in a large phreatic tube apart from 30m in the middle where water rushes over a resistant band of rock and walking is necessary. A final swim reaches a roomy sump which can be free dived following a fixed line. In dry weather the sump is a shallow 7m dive. Beyond........... No description exists of the passages beyond the sump. 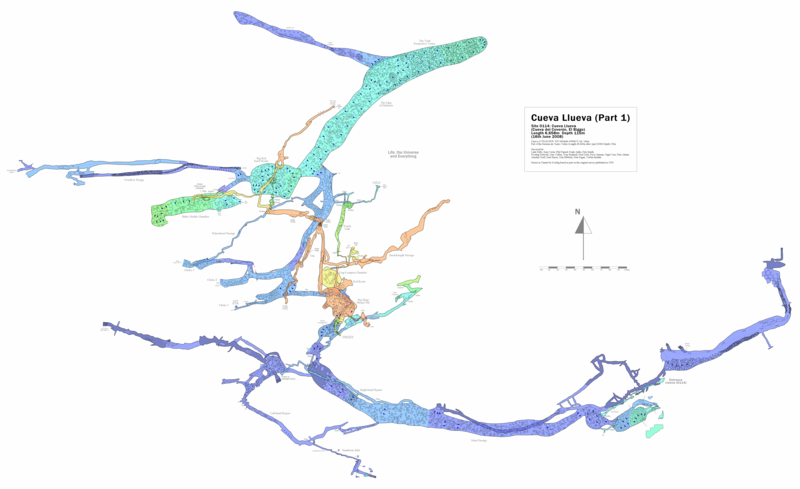 Carcavueso (081) is described up to the connection only. At Christmas 1996, passage to the west off Strangle Wanking Passage was surveyed. During Easter 1999, a climb up near the junction of Straw Passage entered the Timeless Series. This consists of sand-floored rifts and connects to unsurveyed passage just east of Pudding Passage. Further descriptions can be found in the Carcavueso (site 81) text. At Easter 2001, some small passages were surveyed below Rhinocerus Passage near Andy Quin's Foot. Strangle Wanking Passage, (first explored and surveyed from the Cueva Llueva, but now more easily reached from Carcavuezo entrance) was pushed through the terminal sump by Dave Garmin in August 2017 into a bouldery area where orange string had been left from a previous exploration near the end of Cueva Hoyuca. The sump has a line through, bolted at each end, and has been described as a 5 -6m free dive. There is a dangerous rocking boulder on the Hoyuca side which requires some attention. A video of the dive, filming and exploration into Hoyuca has been edited. The survey in the area appears quite accurate apart from the z axis. A number of (re)surveys were carried out in Carcavuezo/Llueva in the summer 2017. Batch 0081-17-01 is the cross over passage near Chase the Dragon; 0081-17-02 is a resurvey of keep Right for Smack; a west-heading passage off the Afternoon Stroll is batch 0081-17-03; Smack Choke corner, batch 0114-17-01; the far reaches of SW Passage, batches 0114-17-02 and 0114-17-03. 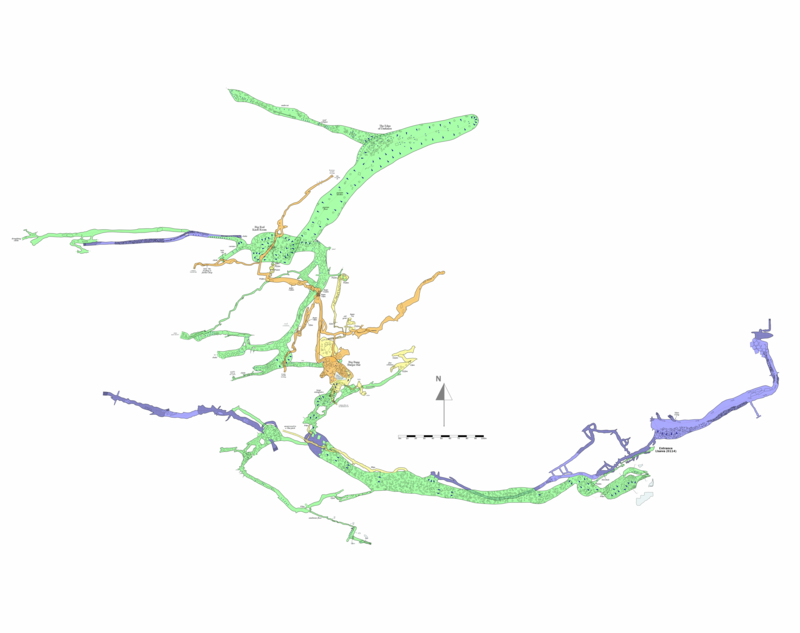 The cave appears on the Cueva Hoyuca and the Four Valleys System Hydrology diagram.